Adiagbon, which can also be written and pronounced Adi Agbon is the Yoruba word for Coconut Oil. Adiagbon is made from kernel (some call this part of a coconut the meat) of matured coconut, as a matter of fact, if you leave a mature coconut (the assumption is that you have removed the kernel from the shell) in the sun or a hot surface, you can see Adiagbon trickling down from the coconut. Adiagbon is a versatile oil, it is used in cooking, medicine, cosmetics and in industry. Its most popular use is in costmestic, where it is used for both skin and hair care. It is widely available in corner shops, online and upmarket organic skin care specialists. In addition to many properties attributed to Adi Agbon, it is said to last up to two years without the need for any special storage because it is a very stability oil. Because is is slow to oxidise, it does not go rancid quickly. This tutorial demonstrates how you can make your own Virgin Adiagbon in a few easy steps. It is now a huge complicated tutorial because it is for someone who wants to make coconut oil for personal use. Obtain mature coconuts from a supplier, coconuts sold in the market for consumption are not the best for making coconuts oil, they tend to be harvested early to keep the meat succulent and tender for eating. Only ripe mature coconuts will give you maximum oil yield. Put the coconut through a food grater, collect the grated coconut and place in a cooking pot, gently heat the pot over a low flame. The heat will liberate the coconut oil. You can use a cloth or a very fine tea strainer to separate the oil from the cake. Collect the oil in a jar or a bottle and you have your very own homemade pure coconut oil. Difference Between Virgin Coconut Oil and Coconut Oil? The main difference between virgin coconut oil and coconuts oil is hinted in the name “virgin” which suggest that the source is pure coconuts oil that has not been ‘touched’ by any additives. Regular coconut oil are obtained from copra. 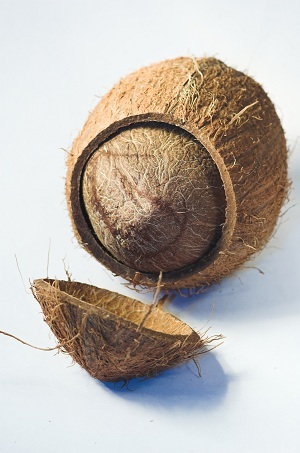 The refining and processing of coconut copra uses chemicals to maximise oil yield from the coconut, the final product is not 100% pure coconut oil any more, some of the chemical used in the refining process would have been introduced to the oil. Because virgin coconut oil is extracted from coconuts meat without using chemicals, it tends to have distinct taste and delicate coconut fragrance. Virgin coconut oil is very versatile, it can be used for cooking in the kitchen and be used in the bathroom as hair and skin care oil. Coconut oil is the staple edible oil in republic of Benin and among the Eguns tribe in Badagry, Lagos State. That was a great write up. Coconut Oil has become a great oil that every household must have. We are a frontline Virgin Coconut Company based in Badagry at Sebasi Coconuts. Whats the difference bw this method and the other where it is sievd anɗ kept overnight before collecting the oil that forms on top? I’d like to sell coconut oil here In ibadan. I would like to sell it in Ilorin. That is a good idea.. Would love to hear how far you went with it.